How do you develop products that people will actually use and buy? There’s nothing more frustrating than putting the time and work into building a product or changing a feature, only to discover that your customers don’t want it. They won’t pay for it, they won’t change their behaviors, they don’t upgrade. Why does this happen so frequently? Because as product people, we fall in love with solutions before we fully understand the problems we’re trying to solve. Customer development is the practice of finding customers first – understanding their problems, how they behave today, and what they’ll pay to solve – and then bringing them along as we build the product that works for them. How do we do that? 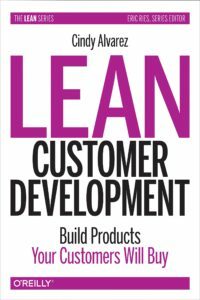 Well, you’re in luck – I wrote a book to tell you exactly how: Lean Customer Development: Building Products Your Customers Will Buy. Read my book, put it into practice, and maybe I’ll speak at your next conference or give a workshop for your team.